The breathtaking Navagio bay on the island of Zakynthos is definitely the most photographed beach in Greece. 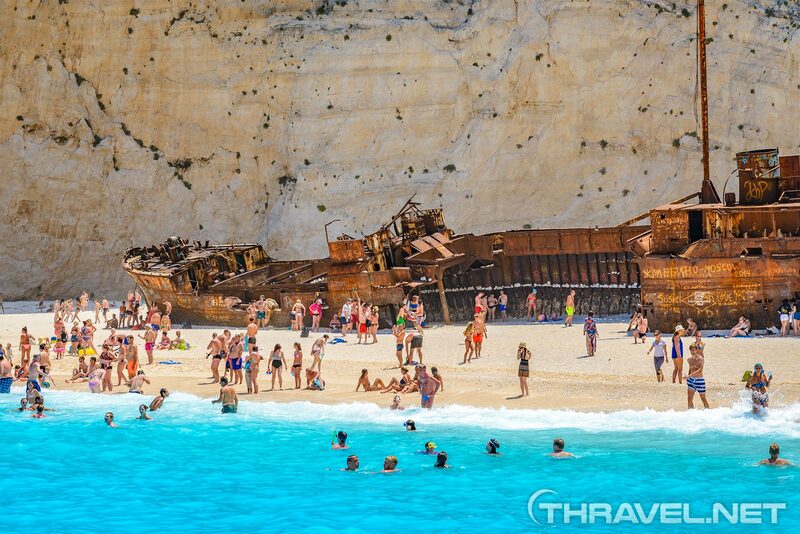 Because of its unique shape and exceptional beauty, the Zante Shipwreck beach is among Lonely Planet’s top 10 beaches in the world. With its majestic cliffs, turquoise waters and dazzling white sand it rivals top holiday destinations such as Maya bay in Thailand. This Zante beach is on the west coast of the island. The place is also named Shipwreck because of the smuggler boat that sank off the beach in the 80’s. Nowadays only the top of the rusty body of the vessel is exposed. The scenery looks like a film décor. During the summer, the Navagio beach gets very busy. Many tourists catch a taxi-boat from Porto Vromi to the Shipwreck. Navagio is also a stop in a round-the-island daily trip. 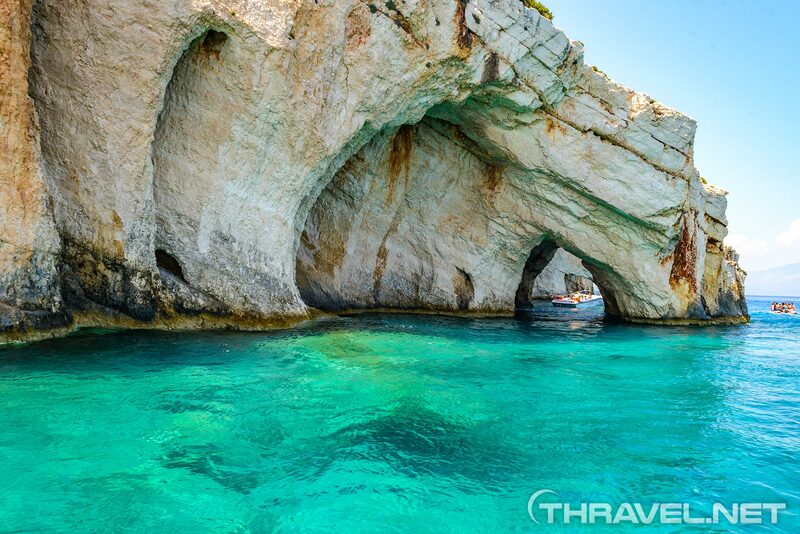 We opted for a daily cruise to Navagio beach and Blue caves Zakynthos with “Captain of cruises ”. The journey started at Makris Gialos. It was a 3-hours boat trip. We stayed 45 minutes at the Bay of Navagio beach and on return we entered the spectacular Blue caves and the rocky arches in the area with the boat. Most of the people swam and explored the underwater marine life. The company claims that their crew is the only one that enters the caves with the boat. That was a thrilling experience! 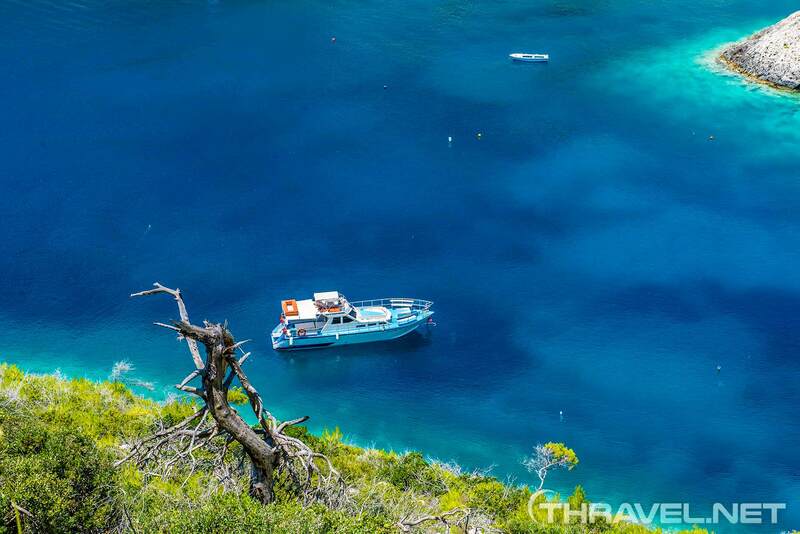 The price of the boat trip around Zakynthos was fair – 15 euros per person. In comparison, there were daily trips available at a price of 10 euros per person but boats were very crowded. Some of them were loaded with 200 passengers on board! “Captain of cruises” offered boats for 22-25 passengers and the experience was more personal. The vessels fit perfectly into the caves and went through rocky arches. We could explore these natural wonders at a much closer range than the passengers on bigger boats. The unique phenomenon named Blue cave is a rocky formation as a result of erosion. The clear sea water reflects the the sky like a mirror and beautifully contrasts with the walls of the stony arches. The only drawback of the tour organized by “Captain of cruises ” was that we did not stop at the shore but in the middle of the wavy bay. People who cannot swim were very frustrated that they were not able to explore the bay and the world famous ship. Even for people who swim, it was difficult to get back to the boat since the bay is famous with its strong undercurrents. It was also impossible to bring a camera on the beach because it would get wet. Bigger boats did stop on the shore but there were so many people on board that when they got off the boat, time was about to run out. “Captain of cruises ”generally offers two day trips to Navagio and Blue caves – from 12.00 to 3.00 or from 3.00 to 18.00. We recommend the first option because the water looks brighter and clearer and waves are not that big. Apart from the boat trip to the most emblematic Zakynthos beach most of the tourists visit the spectacular viewpoint above the bay. It can be reached by car, motorbike or ATV. From this scenic rock, water appears even more turquoise. 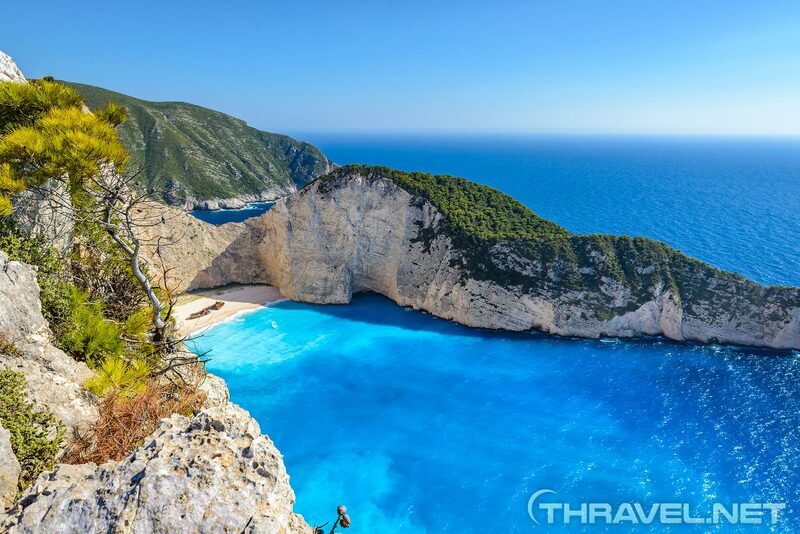 There is a rocky cape stretched on hundreds of meters along the sea that offers stunning views on the Navagio beach. This place is dangerous but very attractive for photographers. The best time to go there is early in the morning – before 10:00 or after 15:00. These are the off-peak times when you can enjoy Navagio’s natural beauty. The shore of the most cosmopolitan resort – Laganas, is considered to be a top Zakynthos beach mainly because it is one of the turtle nesting zones. The territory of the protected area also includes Gerakas and Dafni beaches. From May to August giant sea creatures migrate from the Mediterranean Sea to Laganas bay. That is why people are not allowed to walk on the sand at night. From sunset to dawn, sea turtles come ashore to choose a spot for the nest. Even during the day tourists are asked to limit their activity to a narrow strip of the coastline near the sea – up to 3 meters from the water. People generally follow the instruction not to disturb the turtles’ hatching process. Families make sand sculptures very close to the sea or play beach sports in the water. If you meet a turtle in the sea it is better not to touch it as you could negatively impact its pregnancy. The representatives of the National Marine Park of Zakynthos constantly monitor the compliance with the rules. Turtle nests on this Zante beach are marked by a cage made out of wood sticks. Tourists are not allowed to use their own umbrellas on Laganas beach. Instead they have to use paid sun beds and umbrellas. A set on the central and noisy part of the beach is 5 euros while the price for a set on the wilder part of the beach is 7 euros. 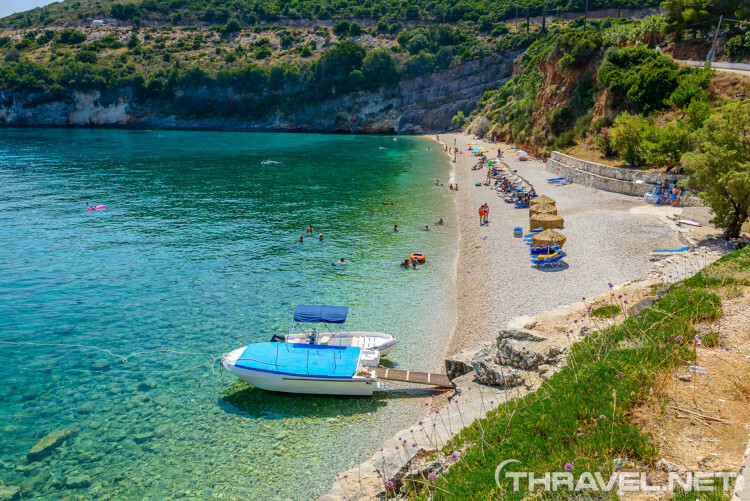 At the northeastern part of Zante we found one of the most interesting places in the region – Xigia Beach. Xigia is one of the highlights of the island of Zakynthos. The tropical-like beach is set between cliffs featuring shimmering and sparkling particles. The turquoise water completes the beautiful landscape. 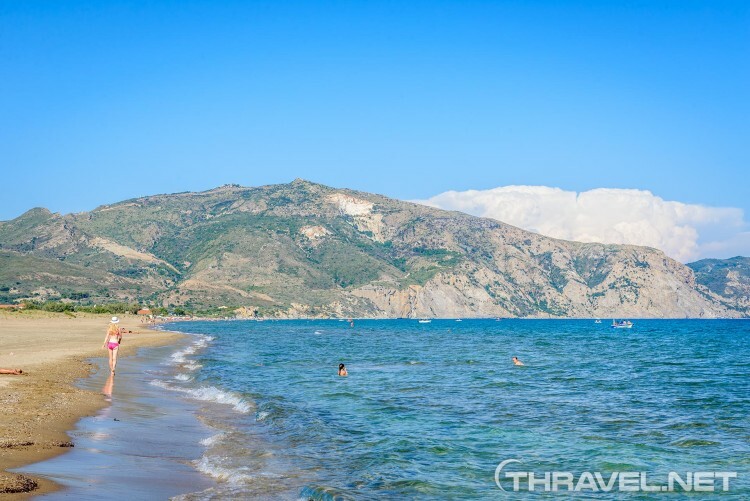 Xigia beach is a 40-minute drive from Laganas and Zakynthos town. 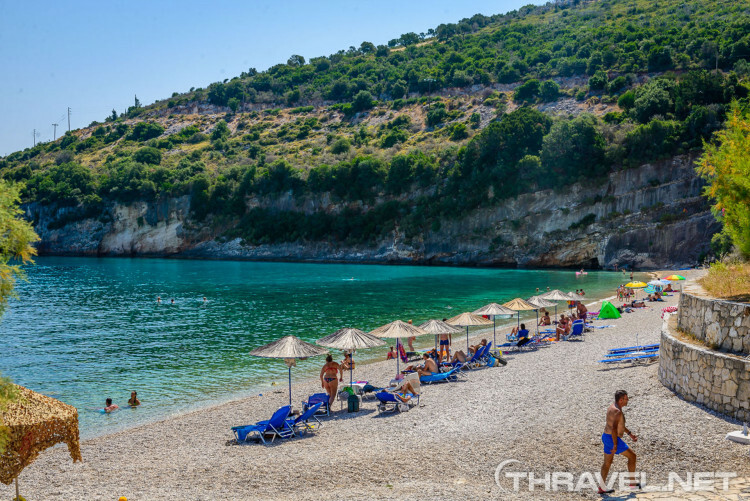 The beautiful beach of Makris Giallos is only 5-minutes north. Many people frequent this small Zante beach. This is not only for the natural beauty of the bay but also for the beneficial properties of the water for the skin and overall health. The seawater contains natural mineral sulfur that is used in cosmetics to treat a wide variety of medical conditions such as acne and eczema. The Sulphur content comes from mineralized spring water that flows into the salty sea. Local people claim that the water around Xigia beach features elements that stimulate collagen growth. The water in front of the Xigia beach is not very clear because of the abundance of Sulphur and other chemical elements. On the left part of the bay the sea gets clearer and it is perfect for snorkeling. There are beautiful rocky formations in the water that make Xigia beach a unique picturesque spot. On the beach there is no natural shadow to shelter from the sun. It might be tricky to put your own umbrella in the pebble surface. There are just a few sun-umbrellas and chairs on the white pebble sand. A set of two chairs is 7 euros. There is a canteen service on the beach. You can get refreshing drinks, coffee and snacks. After a few hours on the beach your skin and hair smell like rotten eggs. There are no fresh water showers so you have to be patient until you get to your hotel room. However, now that we are back home we are more than convinced that the Xigia sulphur springs and collagen spa beach are a must-see place during your stay in Zante. Makris Gialos is probably the best Zante beach. It is named after the big pebbles in the water. In fact, it is a long sandy beach and only the organized part is really rocky. We loved that beach because of the clear turquoise water, soft sand and beautiful landscape. Makris Gialos Beach is located 30 km to the north of the island’s main town. It is perfect for snorkeling. 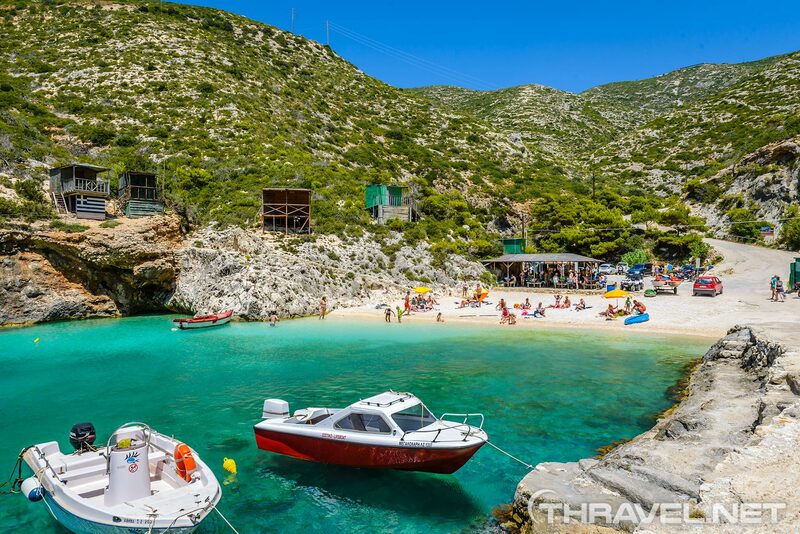 From the central part of the beach tourists can take a boat to the Blue Caves and the Shipwreck Cove. The central part features all facilities such as a refreshment kiosk, sun beds, umbrellas, a cafe with toilets and showers. The staff come to the sun chairs and take orders for drinks and meals. We preferred the right end of the beach where we felt like in a remote, pristine place surrounded by natural beauty. Probably because it is a long walk to get there, under the scorching sun, less people frequent that part of the beach. In the afternoon the hills and trees offer natural shadow. On the top of the hill there is a bar/restaurant with a lovely view over the beach of Makris Gialos. We did not try the food there, because all meals looked like at a fast food chain. We preferred the authentic menu in the Pelagaki restaurant/tavern which was next to Xigia beach. 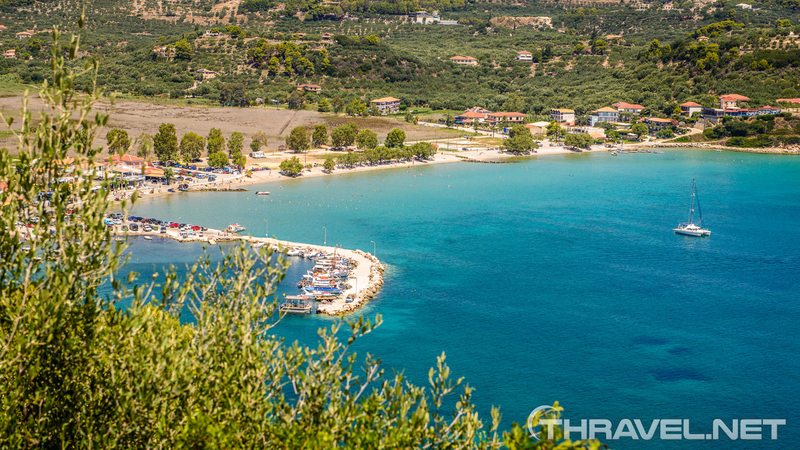 We spent 2 days on Makris Gialos and loved every minute of our visits to this Zakynthos beach. Porto Vromi is just a starting point to a boat tour to Navagio (Shipwreck) bay for some, but for others, it is a beautiful Zakynthos beach where to spend a day. Porto Vromi is a twin bay. The part with the natural harbour can be reached through the village of Maries while the other – through Anafonitria. Both places are quite far so it is not possible to walk between them. We drove to Porto Vromi to enjoy its beach and take pictures of its breathtaking landscape. The excursion was part of our tour of the spectacular viewpoints in Zante. 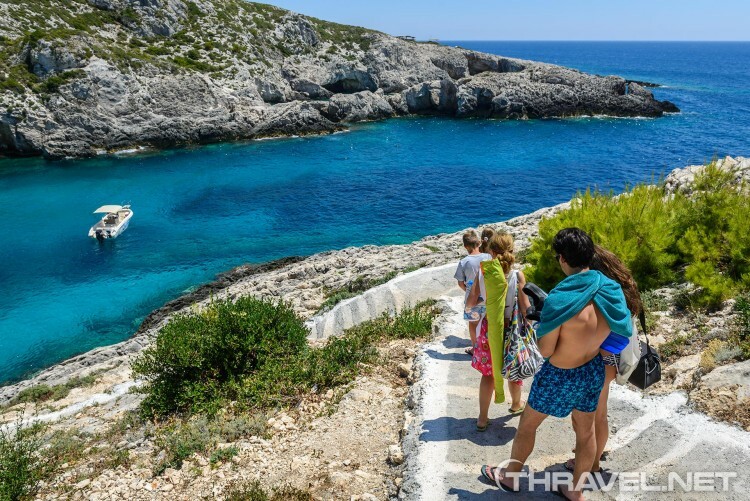 One day before, we did a boat trip to the Shipwreck and Blue caves from Makris Gialos. And that day we wanted to see the island’s highlights from above. That was a scenic drive with amazing opportunities for landscape photography. One of the highlights of the beach was the little cove with turquoise water where we could snorkel. Well, the beach was nice for some, but for others the water was extremely cold for July. We could not use an umbrella on the pebble beach because of the hard surface and the wind so we spent one hour there and headed to the Shipwreck viewpoint. Porto Vromi offers shaded parking, toilet facilities and a cantina which serves snacks. The water is crystal clear, but a lot colder than many find comfortable. Porto Limnionas or the silent harbour is located at the West coast of the island and is considered to be a top Zante beach. Porto Limnionas and Roxa Bay are at a 40-minute drive from Zakynthos city and Laganas. From our host in Laganas we got a tip on how to access the place but it was not easy to find it. The route includes passing by Lithakia, Kilomeno and Agios Leon. All these places are typical Greek villages with Mediterranean-style architecture, small churches featuring both Orthodox and Catholic elements, olive oil mills and taverns. The first thing you see when you get to Porto Linmionas is the parking where you leave your car. On the top of the hill there is a nice tavern with a stunning view on the spectacular Limnionas beach and Roxa bay. Around the canteen, there is an organized area with sun umbrellas and chairs. The price of a set is 5 euros but the furniture is relatively far from the sea. Porto Limnionas is hidden between majestic limestone cliffs. In fact, this is a twin beach separated by a rocky peninsula. The beach, accessible by road is called Limnionas and the one accessible by boat is named Roxa. With its emerald waters, Porto Limnionas is one of the most beautiful beachside places in Zakynthos. The bay is well protected from the waves and is almost perfect for snorkelling in the sea caves. What makes the sea less transparent is the fresh water spring coming from rocks in the bay. The left part of the bay is easily accessible with a small pebble beach, while the right side is rocky and people have to jump into the water to swim. 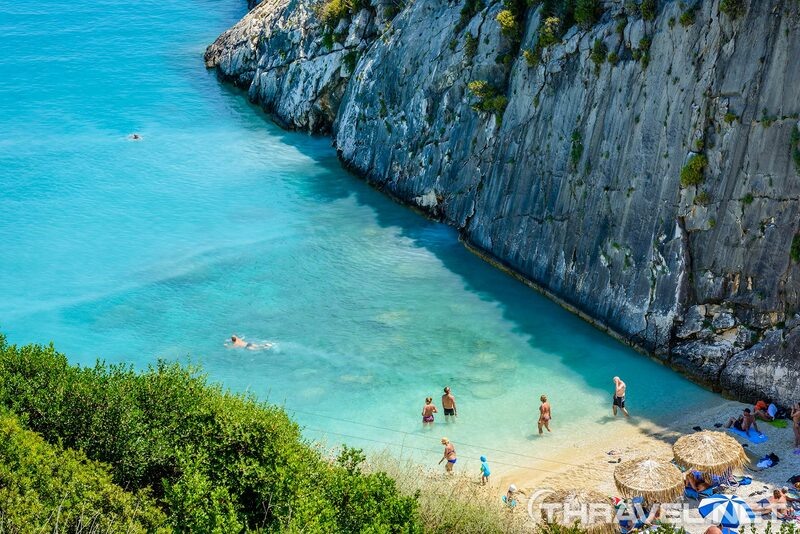 Unlike eastern coast beaches, the West coast of Zante features cool refreshing waters. So even in a hot day, it a great pleasure to swim in Porto Limnionas bay. The landscape reminds of the Paleokastrica beach in Corfu. The shades of the water and the rocky fjords are so similar! Porto Limnionas is a good alternative to the overcrowded Zakynthos beaches. Cameo is a famous landmark in Zante. The small island is connected with the shore of Laganas with a wooden bridge. The rocky islet is a venue for romantic weddings and dance parties. The idyllic private islet has a beach where tourists can relax and have fun. 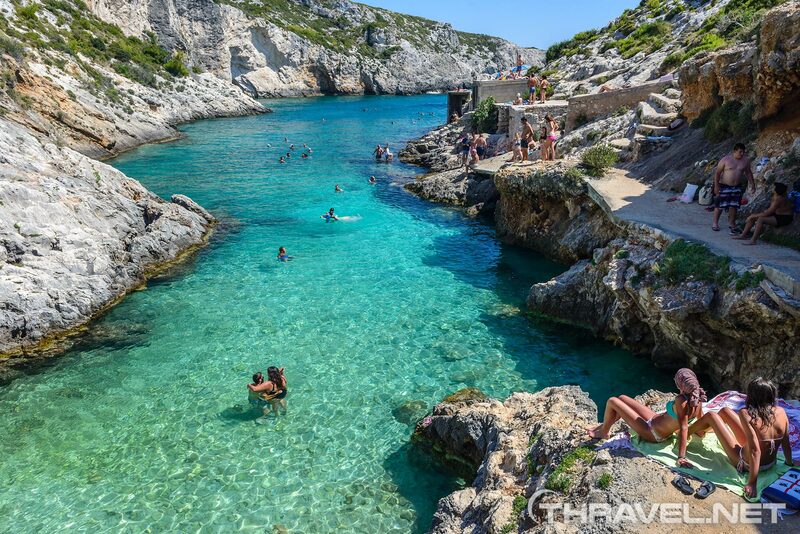 During the day Cameo is a tranquil place to enjoy swimming in crystal clear water away from the crowds. In the evening, the island turns into a venue where popular beach parties or wedding ceremonies take place. This is the only island in Greece that can be hired exclusively for a wedding ceremony or other special occasion. What could be more romantic than celebrating on an idyllic island in the turquoise waters of the Ionian Sea! Cameo Island is located just opposite the right end of Laganas beach. To access Cameo beach tourists walk across a wooden bridge. After climbing a few steep steps they pay 5euro per person to enter the setting. The fee includes a voucher for a drink at the bar. There is a limited choice – for example, you can get a bottle of local Mythos beer but if you want Corona beer you have to pay 1 euro extra. The beach area and the bar terrace have a pleasant atmosphere and offer stunning views. Yet,in July 2016 the staff was not friendly. Still many people enjoy the shadow of the trees on the terrace instead of staying on the busy beach. The island used to be a venue for the popular White parties. In 2016 these events were hosted by the Republic Beach club probably due to the difficult access to the place via a footbridge and a narrow path. Cameo is a suitable venue for guests wearing comfortable outfits, low heel shoes or flats. It is difficult to imagine how people influenced by alcohol cope with the steeper terrain. Marathia Beach is at a 20-minute drive south of Laganas and 25 minutes from the island’s main town. This Zante beach is for people who love nature and solitude. The Marathia bay is surrounded by rocky shores. Just opposite the beach is the famous Turtle island. We were a little bit disappointed with the color of the sea. The water was not very clear and it smelled like gasoline. The sea was not the best spot for snorkeling. On the other hand, the staff in the tavern was very friendly and helpful. They explained that if we would like to swim in a clear water we have to go to Porto Limnionas. In fact, the restaurant with its panoramic view across the bay and the shaded terrace were the only things we liked about Marathia beach. Unlike Laganas bay, Marathonisi island features crystal emerald waters. The landscape looks more tropical. To get there, we hired a taxi boat from Agios Sostis, close to Cameo Island. It was 10 euros per person, both ways. It was a smart choice mainly because we had enough time to explore Turtle Island and go around its beaches. We could decide the time and the duration of your stay on the island of Marathonisi. Marathonisi Island is worth visiting in afternoons (after 14:00 pm) in order to avoid crowds. 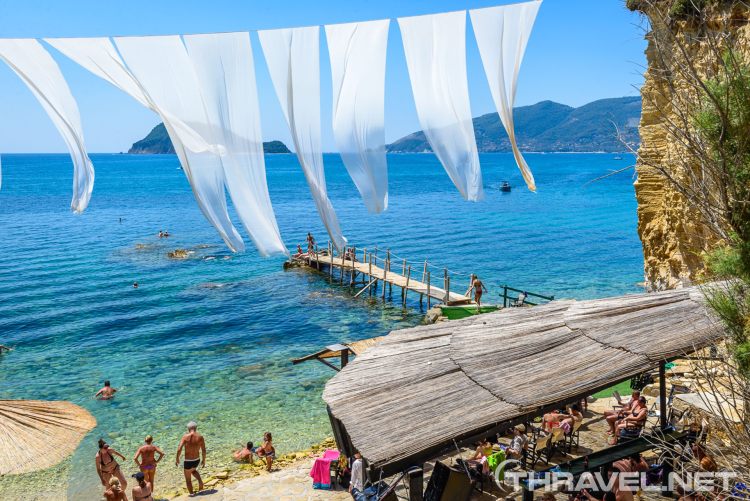 Turtle island is a hot spot for many daily trips around Zante. Hundreds of boats are constantly coming in and out. Since the Island is a protected area for turtle nesting, two thirds of its territory is fenced, so only the beachfront zone is available to walk or relax. Although Marathonisi is considered a nesting ground for Carretta-Carretta turtles, visitors are not likely to see one on the island. In fact, we were lucky to see a just hatched baby turtle on the beach in Laganas in August 2017. There are two small beaches on Marathonisi island. If you walk the south edge of the islet you will find a clay you can use to beautify your skin. If you are thirsty you can buy some refreshments from a boat vendors. Still it is a good idea to bring food and drinks with you since Turtle island has no facilities. Neither there is a restroom.